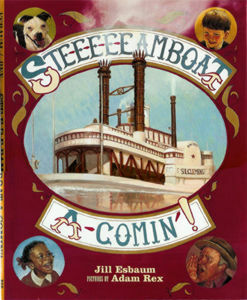 The author, Jill Esbaum, offers a concise lyrical story about America's steamboatin' days. She says her text was inspired by Mark Twain. This is a perfect book to read aloud to children, or the perfect gift for a child who is just starting to learn how to read. Here at steamboats.com, we believe all kids need steamboats in their lives,so this is a good way to get them started! The illustrations, by Adam Rex, are reminiscent of Norman Rockwell. Here's an illustration by Adam Rex and text by Jill Esbaum. hugs and kisses, teary eyes. Click here to see the book at Amazon.com. Click here to go to the publisher's web site.